I didn’t know it had become part of the clutter. Just another item amongst the heap of junk and chaos that became the surface of my coffee table. Distracted, carless, and lazily I used what was in my hands to shove that junk to the side. I didn’t even see it fall, but I suppose it is rare that the person who loses something actually witnesses the fall. The sound of it snapping into pieces was unmistakable. That heart wrenching noise ferociously reminded me I had something of value by violently ripping it from my grasp. I couldn’t look at first, too scared to know the extent of the damage. Denial was setting in. “Please don’t let it be that. Not that one.” I gained the courage to look down, and there it was. My favorite coffee mug on the floor broken in pieces. 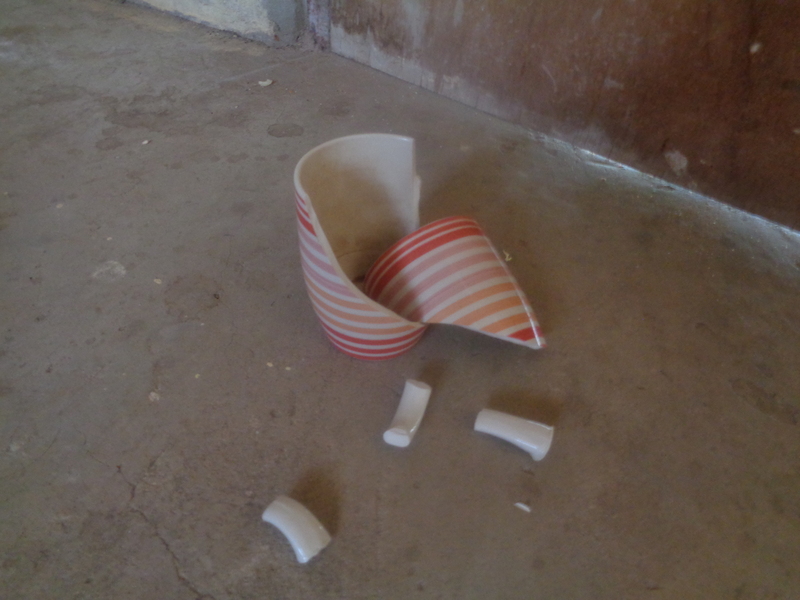 Instinctively I knelt down and gathered the broken mug into my hands. Memories played in my mind. I could feel my hands mold perfectly around the curvature of the mug. The sensation of warmth radiated into my hands, as if I my mug was just filled with hot morning coffee. Scents seemed to permeate the room, like I just lifted the mug within an inch of my nostrils, wafting in the complex aromas of a dark organic roast from Ethiopia or Mexico or Columbia – the smells that always invigorated me, inspired me to change my perspectives, and thus changed me. But at that moment, my vessel for those magical moments lied there in my hands, in pieces, as a result of my own carelessness. I sat silently about ready to accept my loss. I looked over at the bag of trash and then back to the mug in my hands. “It doesn’t have to end here,” I said to myself. “I can fix this.” The mug itself was broken in two and the handle in three. Of course I could fix that. What kind of coffee lover would I be if I didn’t even try to repair my favorite mug? Rather, I just threw it away without so much as an after thought? Not this mug; not this time. I went out, bought glue, and I put the pieces of that cup back together. And although the mug technically lost some sort of dollar value, it’s value to me increased unmeasurably. Hey Andrew, I was in Philadelphia last week visiting with Graham. Thought I’d drop you a line and say hi. Hope all is well. Ah, that makes me miss home little bit. I’m doing well, and I hope you are too. Do you have my email address?